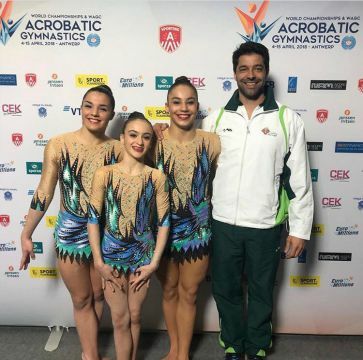 The 13-19 Mixed Pair event was probably the most important competition of today as this WAGC is the only qualifying competition for the Youth Olympic Games. The final qualifiers will be confirmed by the FIG. After the first day of qualifications, the standings were following, Kazakhstan, Russia and Bulgaria. Kazakhstan did a very graceful routine and some solid elements. Fortunately a small mistake at the end didn’t cost them the lead position. Russia again charmed the audience and finished second. Portugal’s bird chirping routine turned into a drum roll (literally and figuratively), just before the first steadily landed element. As a result they finished 3rd, pushing Bulgaria off the podium. In the Women’s Pair event as predicted yesterday the final of the 13-19 event will see partnerships from 3 out 4 continents participating in the qualifiers. The winners of the qualifiers were GB’s Stamatia and Stephanie. Grace and Nyree who were first after yesterday’s competition lost made a mistake that cost them the qualification to the final. The Belarussian pair moved up from yesterday’s 4th place to the second position today. Germany’s Gina and Pia also climbed two places up after their soothing piano routine packed with really impressive balance skills. Israel finally placed 4th followed by the Russian pair, who left the hall speechless after an impressive one foot balance in a standing split. France, Australia and USA will also get the chance to present their combined routine tomorrow. Japan will be the only nation competing in the qualifiers, that will not present their final routine tomorrow. Even though the pair presented some really innovative balance elements that were well received by the audience, they did not score enough to earn a qualifying spot. In the Men’s Pair event both of Russia’s Pairs made it to the top of the ranking. Andrei and Artem were unbeatable after they scored a massive 28.800 for their balance routine, with good artistry score and solid 18.500 for execution, topped with a high difficulty value of 1.2. Their overall score for both routines is 57.500 which is the highest all-around result for any formation participating in the 10th WAGC. The second Russian pair scored 27.700 today, and despite being in second position after the qualifiers we will not see them in the finals. UK’s Finley and Frazer started off with a combination of head balance elements and for their suspenseful, one might even say unsettling, routine score 27.800 which added to their yesterday’s result, placed them in the 3 position. The pair from Portugal Henrique and Tomas put up a real show with their funky interpretation of Another one bites to Dust which earned them the 5 position, just behind their rivals from Belarus. The second partnership from Portugal came 6th but we will not see them in the finals. It is USA and Ukraine who will get their chance to become the WAGC champions in their final competition. In the Men’s Group competition it was again the Russian group who took the lead followed by the group from Kazakhstan. Ukraine had an unfortunate fall during their balance combination, but as there were only 3 teams in this event we will see everyone again tomorrow when they’ll get another opportunity for a flawless performance. Finally in the Women’s Group event there weren’t any surprises. 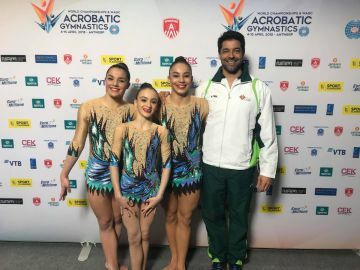 Portugal added 28.500 to their yesterday’s score and finished today with 57.000 sharp, which is the second highest qualifying score of the competition. The trio, who was second to Israel yesterday, today got in the lead with an advance of 0.52 leaving Israel in the second position. Belgium’s strong representation took over the 3rd and 4th place. It is Lise, Bo and Yana scored 0.26 more in the overall qualification and they will be the ones who get to perform in the finals. A gracefully performed routine to James Bond soundtrack earned the British trio the 5th position. In the final round we will also see Ukraine, Russia, USA and Belarus.